When a voltage is applied to the coil, a current passes through it and this creates a magnetic circuit which includes the core, armature and the yoke. The core attracts the armature, which pivots and presses the push rod against the common contact, breaking the electrical connection with one contact and making the electrical connection with the other contact. When the voltage is removed from the coil the magnetic attraction of the armature to the core ceases. A spring then returns the contacts, pushrod and armature to the initial position. 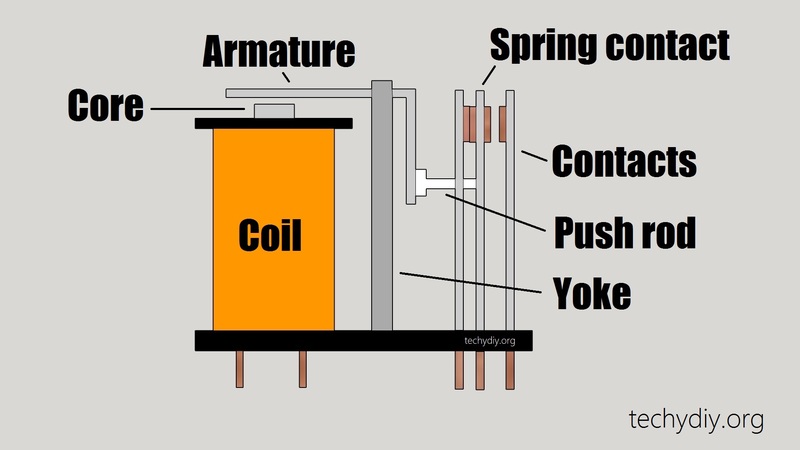 In this example, the common contact also acts as the spring, but in other relays, a separate spring is employed. Relay contacts are available in several different combinations specified as pole and throw. Poles are the number of separate electrical circuits. Throw is the number of contact positions for each circuit. This is a simple on-off switch. This is a single changeover switch. This is two separate changeover switches that operate at the same time. This is four separate changeover switches that operate at the same time. With break before make the common contact disconnects (breaks) with the first contact before connecting (makes) with the second contact. Make before break – the common contact remains connected to the first contact until after connecting to the second contact. It then disconnects from the first contact. The electrical circuit between COM and NO contacts is made when power is applied to the coil. The electrical circuit between COM and NC contacts is broken when power is applied to the coil. Relay contacts can be made from different materials that make them suitable for different types of switching. Switching a low-level signal requires a different contact material to be used than when switching a high power load. For low-level loads, a minimum switching load is specified. For example 10mA at 5VDC. This is normally specified in VA for AC and Watts for DC. The maximum for inductive loads will be lower than the maximum for resistive loads. Specified in volts this will be different for AC and DC. The coil specification will include the nominal voltage, maximum voltage, nominal current, resistance, pull in voltage and drop out voltage. When there is a change of current in the relay coil due to it being powered off, the inductor will try and maintain the current by generating a voltage spike. This voltage spike can be hundreds or thousands of volts, which can harm sensitive electronic components such as transistors. To prevent the voltage spike, a snubber circuit can be employed. Usually, this takes the form of a clamping or free-wheeling diode , reversed biased across the coil. The downside to this arrangement is that the switch off time for the relay will be increased. 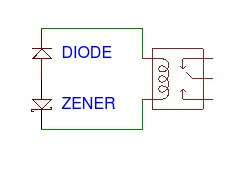 To improve this, a zener diode can be added in series with the diode. This then increases the voltage across the coil and dissipates the stored energy faster. Other options for snubber circuits include a resistor, a series resistor and capacitor, MOV (Metal oxide varistor) and TVS (Transient Voltage Suppressor). 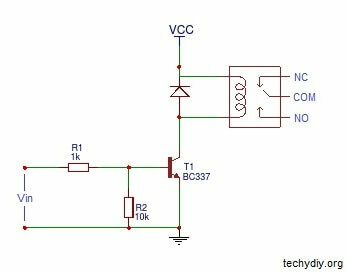 To drive the relay from a low power signal a transistor is often used to switch the relay. No voltage applied to Vin – Current does not flow between the base and emitter of the npn transistor and current does not flow between the collector and emitter, so the relay coil is not energised. Positive Voltage applied to Vin – Current will flow between the base and the emitter of the npn transistor and this allows current to flow between the collector and emitter which energises the relay coil. The transistor has gain, so only a small amount of current is required to drive a large amount of current to energise the relay coil. A free wheeling diode is placed across the coil to suppress voltage spikes. Relay modules are commonly available for use with the Arduino and other microcontrollers. The modules have a printed circuit board with a relay, driver, input pins (which are easy to connect to a breadboard with jumper wires) and output screw terminals. The modules are available with 1, 2, 4, 8 etc. relays. The simpler type of relay module has a transistor for switching the relay coil, a free-wheeling diode across the coil to prevent back emf and an led, which indicates when the input signal is high. 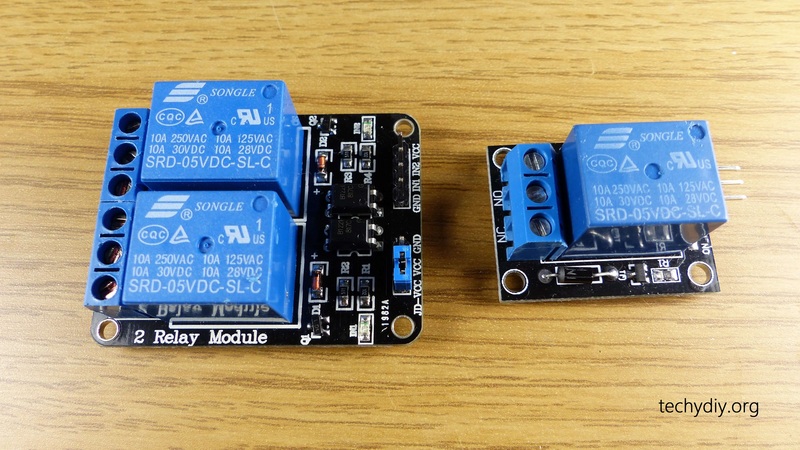 This type of module has active high switching, which means that a positive voltage on the input will switch the relay on and a low signal or connection to ground will turn it off. The more complex type of relay module employs an opto isolator. 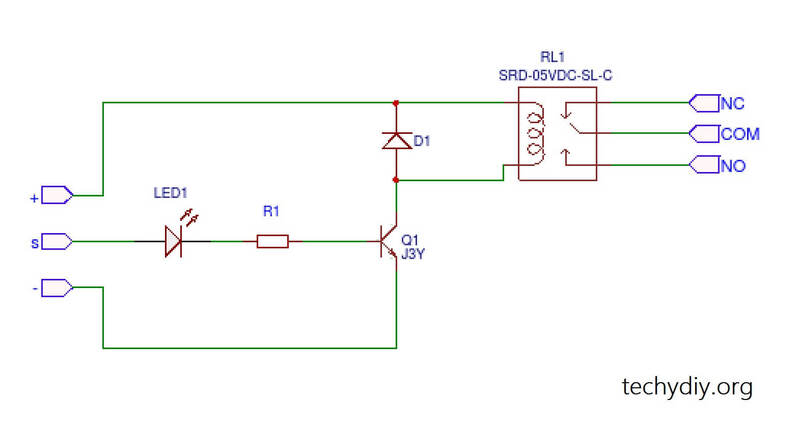 This allows the input circuit to be electrically separate from the relay circuit. When the led in the optocoupler is powered the light produced turns on the light sensitive transistor, this in turn, enables the transistor Q1 which activates the relay. To isolate the circuits the jumper between VCC and JD-VCC is removed and a separate power supply connected between JD-VCC and GND to power the relay. The connections to the input circuit are VCC and IN1. This type of module has active low switching, meaning that the relay is enabled when the input signal is low and deactivated when the input signal is high.